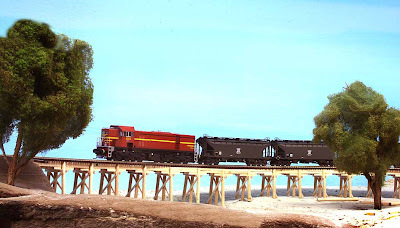 Branchliner 4914 crosses the unfinished Namoi River bridge with a rake of FWH. After a week of off and on progress, the Namoi River Bridge has nearly spanned the 250-some foot gap between Narrabri and Narrabri West. I hesitated making this too easy on myself. 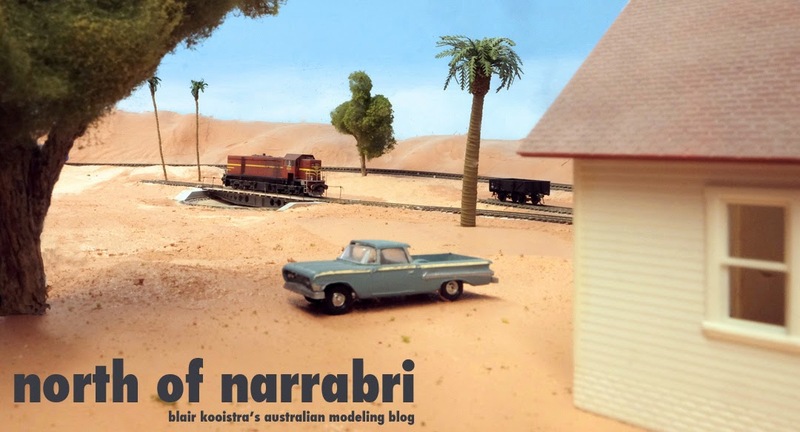 . . the simplest solution would've been just to plunk down $30 or so for a plastic Walthers kit that was generic in nature--North American, certainly not NSWGR. Another option was a laser-cut wood kit; given that I'd probably need four or five of them to reach across the river bed, at $30 a pop, this was cost prohibitive. 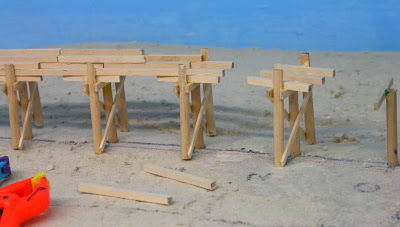 A third option was to purchase the wooden trestle bents pre-made--again, they wouldn't have "looked" correct for NSWGR, and these were around $5 a piece, and depending upon the bent spacing, i'd have needed 10-15 of them. But, armed with two sets of NSWGR plans provided by Ray Pilgrim, i decided to expand my modeling horizons and scratch build the structure. I needed to resolve conflicts between the two plans, namely, the actual plans for the bridge on the branch near Wee Waa, which featured 14' spacings between trestle bents, and a plan not specific to site in which the bents were 24' apart. I decided to go with the 14' spacings, but combined this with the 9'6" Korbel atop the bent pilings and two layers of support beams. The bents consisted of three pilings, consistent with NSWGR practice for trestles under 18' in height. Spaced 14' across, and including a bent at each end of the bridge against the wing walls, I'd need 18 bents for the 250' bridge. Material costs so far for the bridge have been minimal: under $40. The trackage will be a Micro Engineering Code 70 open deck trestle 36" piece of bridge flex track, which includes guard rail pieces, around $10.00. The rest of the cost is lumber, and thanks to Michaels, a local craft shop, these were exceeding reasonable: two $1.99 packages of 1/8" X 12" dowels; 15 1/8" square X 24" pieces of strip wood (at $.59 each); and from my local "last resort" hobbyshop, two packages of Northeastern Scale lumber, much more expensive--4" X 8" scale strip for the diagonal bracing, and 12" X 6" strip for the crossmembers which tie the pilings together. . .both for around $3.50 each. I've yet to price out the nut-bolt-washer castings, since i've not yet convinced myself I want to face the frustration level of adding them to the bridge! 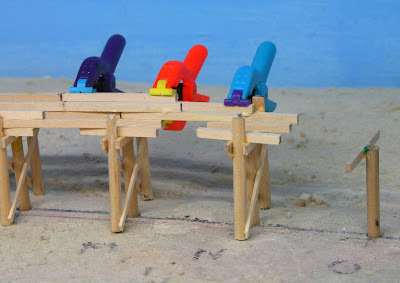 Wood glue sticks to the strip wood and dowels, but not to the styrene trestle jig, where 18 bents were assembled on the workbench. Making it hard on myself. . . If I had been thinking, I would have held off doing any landform work in the bridge area before completing this structure. 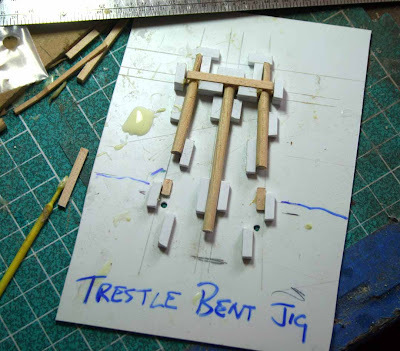 The best way to build the trestle would've been to assemble it on a piece of wood on the workbench, and after assuring everything was square and fit perfectly, installed the bridge on the layout, building the scenery around the bridge. As it was, I assembled each bent on the benchwork in a styrene jig, then assembled the bents on the layout in place, inserting the middle bent piling into a hole drilled into the stacked ceiling tile along the 31 1/2" radius centerline. This resulted in much more work and fussing to keep the bridge in alignment, and consistent with most of my other scratchbuilding efforts, the bridge has a couple of little dips in it and through one section along three bents the radius is abit less than originally called for. Before the bridge is "permanently" installed on the layout, I'll be sanding down a couple of high spots atop the support beams the trackwork rests upon. Being as this is a fairly light-duty trestle to begin with, the somewhat less-than-perfect quality of the bridge alignment just "adds to the charm". After assembly in the jig on the workbench, each bent was moved to the layout, where it was positioned along a radius center line. . . I've still got to finish the last three bents as well as "backfill" the scenery forms behind the not-yet-built wing walls. . .then there's the "detail work" of cables that bind the bent columns to the korbels and the NBW castings, and the painting and the weathering and the fitting. But, the majority of the heavy lifting is (I hope) done at this point. So, i hope you don't mind a shot of a grain train on what's been completed so far. . .another mock up image to keep me motivated towards the end product. . . Looking good Blair, I think the odd sag will only make it look like the actual thing, they were very old by the period you're modelling. Regarding the photo mock up, I have just posted a 'How to take model pics and improve your modelling' article on my BYLONG blog.